On our first trip to Poland together, I walked into a Carrefour in a shopping mall in Krakow to buy a few supplies for a long bus trip Renata and I were taking to Chelm. After I paid for the groceries, the cashier did not give me a plastic bag for the stuff I bought. I was a bit surprised, but since I don’t speak Polish, I could not ask for one so I just scrambled and held everything in my hands – Renata was not with me to help because she was looking for something at another shop. After she returned, we walked together into the market and asked for a plastic bag, and we were informed that we had to pay for one – it was a small amount (something like a nickel US) but it kind of threw me for a loop. I had heard that places like Farmers’ Market on Union Square were charging for plastic bags, but I had never seen it done in a supermarket. I did not really mind the move, really. I had been using reusable bags for some time (yes, I was that hippie in your supermarket) and I just guessed that Poland had gone the extra mile. When we got to Renata’s hometown and visited her local market, the first thing I did was buy a reusable bag – and took one with me the next time we visited the country again in 2014. Ever since I learned about how using disposable bags can be bad for the environment, I have been trying my best not to use them. Though in Manhattan doing so has become quite commonplace, Staten Island has not gotten there yet. I am apparently still a bit of an odd cat – I am yet to see anyone use reusable bags in my local supermarket or at the nearby wine store. Indeed, every time I buy wine the lady at the counter automatically pulls out a plastic bag, even when I am standing with an old canvas LAMC bag in my hands. I have not, however, completely ruled out plastic out of my life. I often shop at certain stores in Manhattan during the week and sometimes I just don’t happen to have my cloth bags around. However, I always reuse them to pack our lunches (containers might leak) and also for trash. Whenever I buy a small number of items I just stuff them in my backpack – why create waste in the first place? Here in New York there is talk of creating a surcharge for plastic bags, and it has already become a political issue. Since Bill de Blasio is the first democratic mayor of this city in two decades, right wingers and the media that support them have made it a point of attacking every single one of his moves – and plastic is no exception. When I read this I was dumbfounded – it means that basically whatever environmentalists are for, republicans are against as a matter of principle even if it ultimately hurts everyone. Never mind that plastic is one of the greatest single polluters in the world and that reducing the amount of the stuff around would immensely help reduce the amount of waste on our landfills. As the piece also points out, the press here is sharply divided. The New York Times, it recalls, put a piece in favor of a small surcharge for plastic bags while the Murdoch-owned New York Post published an editorial opposing it simply because it is an environmental issue. If you want my opinion, both sides are wrong for politicizing this. 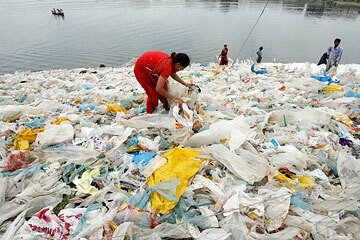 The simple fact is that that we overuse plastic in this country. Why do you buy a bottle of water (another problem, but let’s focus here) and put it in a plastic bag only to discard the bag the moment you walk out of the store? Do you really need a temporary container for a coke and a bag of Doritos as you make your way home from work? Sure, some folk might say that plastic surcharges or bans would hurt low-income, minority neighborhoods, but that is simply not true. 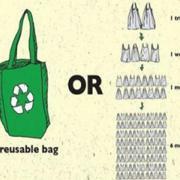 Reusable bags go for as little as a dollar in many stores, which basically give them away at a loss as an incentive for their customers to stop using disposable bags. Trader Joe’s, for instance, sells wine totes for 65 cents – is it really too much to ask when you are buying a $30 bottle of Barolo? I still have the very first tote I bought there – it has lasted over four years. Other businesses have also created other ways to get their customers to consider using reusable bags – Astor Wines in the East Village gives customers a ten-cent discount if they bring their own bags. It doesn’t seem much, but if you are a regular customer it surely adds up – if you buy wine on a weekly basis, at the end of the year you will have saved over five bucks – enough for one of these cheaper brands some use for picnics or at parties after the good stuff is gone. The thing is that hoping people will get educated simply doesn’t work. How many people even look at those “Green Birdie” ads on the subway? Hoping people will do it on their own simply won’t work – just ask the civil rights activists trying to reason with the Bible belt. While I am not really in favor of outright bans, I think that getting folks in their pocketbook will ultimately work – taxing cigarettes and water bottles forced folks to think twice about their everyday habits, and if past is prologue, charging for those plastic bags might not make them disappear, but you will certainly see folks reusing bags if they have to pay for something else.